We show many sofas and sectionals that in our showroom. 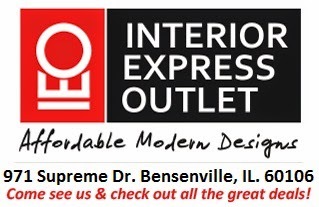 Recently, we even introduced some models exclusively for Chicago furniture warehouse sale. When we reviewed it last week, we found this black sectional we introduced about a year ago has become the top seller. It is a modern sofa chaise sectional with adjustable headrests. The metal legs give it a sleek contemporary style. It comes with a matching ottoman with the same legs, and the entire set is being offered for a low price at this moment.